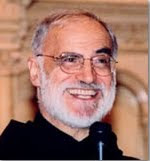 This is an abridged transcription of one of the Lenten reflections given during a retreat for the Roman Catholic bishops of Ireland in 2002 by the Papal Household Preacher, Fr Raniero Cantalamessa. After the events of 11th September, people were all of one mind in the conviction that "Nothing will ever be the same again". The end of the cold war left us believing that the world, as we now assumed it to be, would last indefinitely. Without warning, this assumption vanished into thin air, and all the old problems, including even the traditional ideas of war and peace, came back into discussion. What will those who believe in Christ do, what will the Church do, in circumstances like this? The church cannot simply unite her voice with what Psalm 31:20 calls "the strife of tongues". She needs to be able to speak a word that, like the words of Jesus on the events of his day, will carry the resonance of truth and of eternity. Many centuries ago, the Church found herself in a situation that in many respects matches the present one. On August 28th in the year 410, the hordes of Alaric, king of the Goths, stormed the city of Rome, put it to the sword and burned it down. In the world of that time Rome was all that New York is today, and something more besides. It was not only the capital of culture and commerce, but also the centre of a world political power. The emotional impact, even on Christians, was enormous. Many had believed that the Roman Empire had been the power that was restraining "the mystery of lawlessness" until the time had come for it to be revealed (See Thessalonians 2,6-8). If that was so, it is easy to see how readily they would have come to believe, confronted with the sack of Rome, that the end of the world had come. The world was shaken to its very foundations. Pagans of the time had their own explanation for the events. The catastrophe was clearly the result of having abandoned the traditional religion and the gods of Rome, and the fault clearly lay with the Christians. The Christians, from the time of Constantine, had been saying that the freedom given to the Christian religion had proved a greater support and protection to the Empire than the pagan gods had ever been. In this sad state of affairs, everyone was looking for an answer. And Augustine, the bishop of Hippo, did have the answer: If so many Christians find themselves demoralised by the new situation and begin to murmur against God, saying that he should not have allowed such a thing to happen, it is because they have not yet grasped the real meaning of their faith. the goods and pleasures of this world.